Two years ago, together with my family, I discovered Disney-world. On the one hand it was an extraordinary moment and on the other, it felt very strange. It was like being in a cartoon, with all the magic and the extravagance uncle Sam’s capable of, while witnessing very unusual behaviors. Indeed, you wouldn’t imagine Europeans walking through a theme park with blinking Mickey Mouse ears on their heads. This was the kind of things which reminded us of the cultural difference existing between the old and the new continents. Nevertheless, as an achievement, this theme park, the size of a city, is a real tour de force and deserves respect. Did you know that before being able to set it up, the good uncle Walt has had to knock at no less than 302 bank doors. Just think that for most of us, when looking for a simple mortgage, going to more than three or four banks is already a painstaking process. 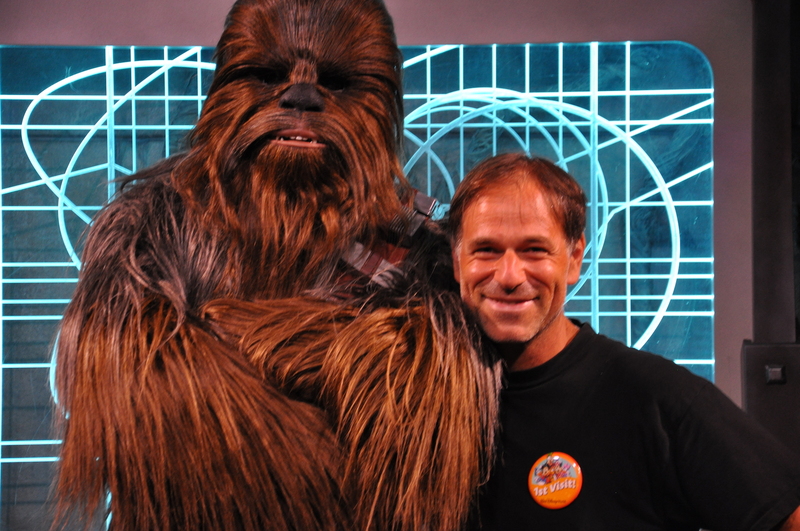 Regardless, that’s where I’d meet with one of Star-Wars’ most famous characters, Chewbacca. Obviously, the guy in the suit didn’t know me. Nor was him most likely even born 41 years ago when the first movie was released. At first, I went ‘meeting’ him for the fun and to please my kids. But I felt all of a sudden overwhelmed and unexpectedly moved in his presence. It felt like going back to my childhood and encounter in the flesh an old friend who had been part of my life for ages. A very strange, but intense feeling. I believe that’s the very purpose of movie stars. They give us a sense of continuity. By the way, isn’t that exactly what families are all about, continuity? So, let me give you the simple advice I got straight from Chewbacca’s mouth: revere any minute, any second, spent with you family or your dear ones! May their love be with you forever!